Our Ikebana workshops were FULLY BOOKED and very successful at Wa: Ikebana Exhibition, Abbotsford Convent, on 7 October 2018. Thank you, our instructors - Shoan Lo, Shoen Loo, Toko Tazawa, Aileen Duke, Akemi Suzuki & Pulcheria Reeves. We received wonderful feedback from our participants! Thank you all the participants. 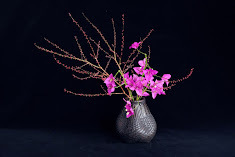 We hope you will continue learning Ikebana.